Ok, so you’ve got a cast or bandage on your leg but you still want to be able to enjoy a relaxing bath or shower or take your regular swim. Good news! 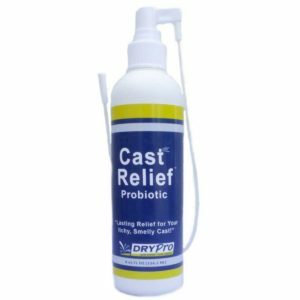 – thanks to our patented vacuum seal, the DryPro waterproof cast cover allows you to do all of the above while keeping your cast or bandage completely dry. When you pump the air out the pump not only creates the vacuum seal but also works as a gauge showing that the vacuum is intact and cannot leak. The DryPro waterproof fabric is rugged. It is made of durable high quality surgical latex. The special Non-Skid Grid™ protects the sole and helps prevent slipping. I saw this product advertised on a notice board in Tallaght Hospital & took a picture with my phone. It’s a wonderful product & I have used it after knee replacement surgery to keep,stitches dry when showering. I highly recommend it because it does what it says on the tin ! Wonderful service too, had it next day & no delay at all. I just had a varicose vein operation so have a bandaged leg. I bought the Drypro for full leg. It works a treat. I can shower easily and the bandages are dry. Happy days!! I bought DryPro online and it was delivered the next day! It is a fantadtic product. I have been in a cast for six weeks for tendon transfer surgery and the DryPro has been a godsend – so much so that when I go back to see my Consultant in Santry Sports Clinic next week I am going to tell him to advise his patients who need casts to invest in one!!!! I was able to shower and have baths because of this incredible product! I would HIGHLY RECOMMENT drypro! Very good service and product. Works perfectly and gets rid of all the tape and plastic bags. I’m really pleased with this product. I fractured my ankle just before a holiday in France. It arrived on time in the middle of nowhere and I swam daily. Really easy to get on and off and its completely watertight. A great product I can’t recommend it highly enough. 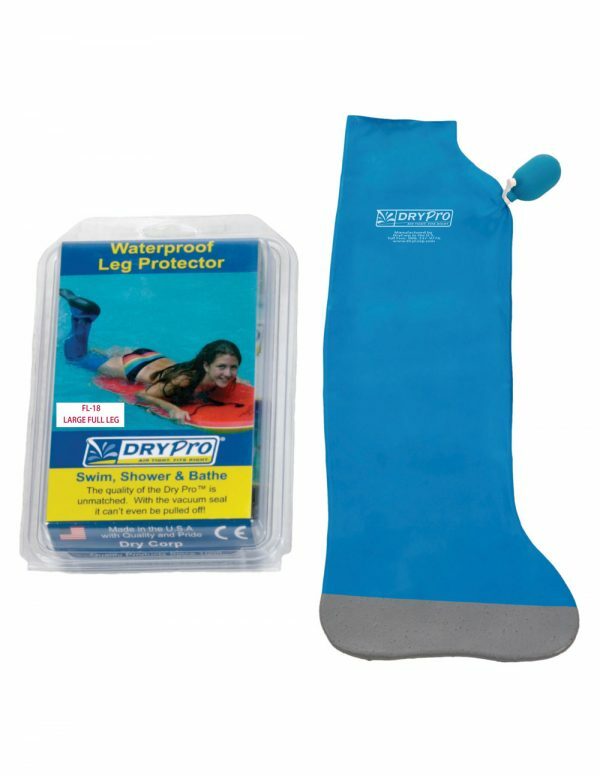 I just purchased the half leg Drypro for my holidays as I have a venous leg ulcer for many years so I cannot swim in a pool which is awkward and annoying as we have a villa with private pool so it’s on my door step teasing me on these hot days. I was recommended Drypro by a pharmacy in Cork…I ordered online and it was delivered the next day. I am currently on holiday and using my Drypro a few times a day. I have used many other products over the past 15 years which either tear or leak so this is an amazing product which is strong, simple to use (getting on & off) and is completely waterproof! I am delighted I made the purchase and would strongly recommend it to anyone in the same situation. Go Drypro ! With full leg cast with very little space between top of cast and top of leg trying to secure plastic bags would have been a nightmare! The DryPro was easy enough to put on even for an arthritic 70 year old. First couple of times I needed assistance getting it off but now even that is achievable on my own. If it wasn’t for the weight of the cast I’m sure the cover would enable swimming with no problem of leakage. Wouldn’t want to be weighted to bottom of pool though. The joy of being able to shower thoroughly with no fear of getting cast wet more than justifies the reasonable price. Couldn’t recommend highly enough! Absolute lifesaver! Amazing product. Easy to use; secure in knowledge your cast will keep dry. Cover dries quickly and is easy to store. Customer service were very helpful . Could not be without this so handy and has made my 1 legged life so much easier !! Get one if your in need you won’t look back . Great product. Made it possible to have baths and showers after ankle surgery with much more ease than I could have hoped for before coming across the product. Never even had a leak so kept the cast from getting itchy. Well worth the small investment and very quick delivery. Serious find from my girlfriend. Fantastic product. My hubbie using it daily.. easy to put on and take off. The non slip sole is very reassuring when hobbling around the shower. This is a great product. After ankle surgery in the hospital I tried to shower with just plastic bags covering my leg… It was really difficult and stressful. Now I can enjoy my shower and take my time … The cover is quite stretchy so I have no problem getting it over my quite big cast.. And it is still watertight around my knee. Well done. My Dad, in his 70’s used the legcover after injuring his foot. He is a daily swimmer and was really upset when he was told that he could not swim until his injury had healed, the leg-cover solved this problem and he was able to swim daily . He had no difficulty in using the leg cover and his wound remained completely dry. Many thanks, an excellent product which we would recommend to anyone. Quick delivery within 72 hours from Dublin to Belgium. Excellent customer service! Used it for 2 weeks for our 2 year old with a lower leg cast. Worked a lot better than other products on the market. Easy to use, the cast stayed 100% dry. She wanted to take it off after about 20mins-but definately long enough for a bath or quick swim. I was sceptical that it would work as well as it claimed. But it does and its given me my sanity back by allowing me to wash safely and properly with my broken ankle. Will be my first port of call should one of the kids ever need something again. Our son broke his ankle at the start of summer, and we purchased the /2 leg full size cover. Purchase was HARD…had to phone Ireland but eventually sorted. The cover was great for shower etc and for short swimming bouts. We found the cast was getting damp: we filled cover with water and it was definitely water-tight. Conclusion was that either it was condensation (Rubber + body heat + sun) or that water was getting in through the top, although we doubt that. It made a big difference to our son in terms of swimming with family etc and I would recommend this product – the pump makes it absolutely tight. The condensation was fairly light and was after about 20 minutes swimming. Thereafter my son swam for 20 minute sessions before we let his leg / cast cool off and started again. I had a major ankle fusion operation on the 23rd June ’14, as a result I will be in a cast for three months. having read about the leg covers I decided to purchase one. It was one of the best decisions I ever made.I would recommend it to anyone in a similar situation. I am delighted with my cast cover. I broke my heel bone and will be in a cast for at least 6 weeks.This allows me to shower with no fear of getting my cast wet. I could not recommend it highly enough. My son broke his leg two weeks before our holiday and thanks to the half leg cover he was able to swim every day. We were quite cautious at first but needn’t have been – it is an excellent product which kept his cast 100% dry. Would recommend this to anyone. Our 22 month old broke her leg a week before our recent holiday. I have been in leg bandages for several years due to health issues, I had to give up swimming and all watersports I loved until I found this amazing product and it changed my life forever! I recently went on holiday and I was in the sea and pool daily and not once did my bandage get a drop of water on it! I highly recommend this product. Excellent product, easy to use and very effective. Made showering possible, would highly recommend it. Excellent product,i ruptured my achilles tendon and to be honest cannot say enough about how brilliant it was. Gave so much freedom for showering,bathing and swimming, it made a nice change from clingfilm and plastic bags. Would recommend this to anyone in similar scenario, or any foot cast. This is an excellent product and performs as promised. It is easy to get on and off. I have taken a bath and shower and just today went down to the pool for a swim. Bravo! Having been mortified at breaking my ankle in the first instance, not being able to bathe was a secondary – but embarrassing – situation. 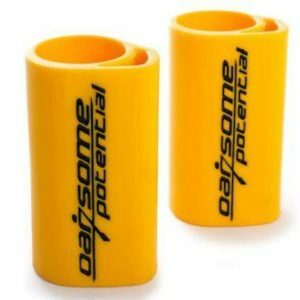 Having never broken anything before and being a complete novice to the world of casts, finding that there was a product that could help me felt like a miracle. The service was fast and the product did exactly what it said on the pack. For anyone with a cast, I highly recommend this as a top product. Before I bought my leg cast cover, I hoped it would be a) the safest I could get, on account of having a different base for grip b) the most robust (relying on a vacuum, not just a bit of string) and c) one of the quirkiest products out there (if I was going to have to put up with a cast I wanted to have some fun with it!). I wasn’t disappointed. My only question is: what application does it have now that I am out of my cast?! PS For anyone using one of these for the first time, casts are incredibly buoyant. I did not know this and was quite surprised when my DryPro bedecked leg almost popped out of the bath of it’s own volition! Couldn’t recommend this product highly enough. After being out of action for 6 weeks with a fractured ankle, this cast cover enabled me to shower and swim without a single drop of water seeping through to my cast. A simple yet highly effective product which signifies some excellent innovation, thanks again for introducing this to the market, it annihilates what your competitors are offering!